Toward the end of the year A.D. 8, the emperor Augustus publicly sentenced the poet Ovid to exile in remote and barbaric Tomis on the Black Sea. The action presumably followed a secret hearing before the emperor, and the official reason given for the sentence was Ovid's authorship of a licentious work, the Ars amatoria, ten years earlier. 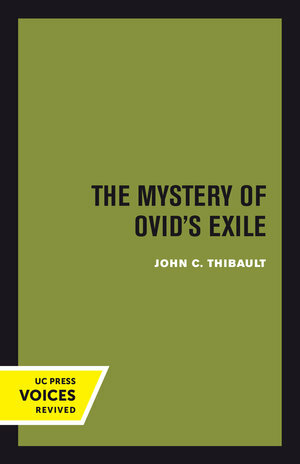 The Mystery of Ovid's Exile is both a survey and an analysis of the literary detective work that has been devoted to explaining the cause of Ovid's banishment from Rome. In poems composed during his exile, Ovid laments having written the Ars amatoria, but he obviously considers the poem to be merely a pretext for his punishment. His downfall appears to have been caused by his having witnessed, or in some fashion been implicated in, a crime committed either by the emperor himself or by an immediate member of the imperial family. However, it’s possible that Ovid's banishment may have been ordered merely because he was unwittingly in possession of the key to an embarrassing secret, the importance of which he might have realized had he remained in Rome. John C. Thibault examines more than one hundred available hypotheses that have been advanced by inquisitive scholars from the Middle Ages to our own day. He demonstrates the unsoundness of each hypothesis in turn, and suggests that a solution to the problem of Ovid's exile is not possible given the available evidence. The Mystery of Ovid's Exil treats a controversy that will fascinate classical scholars as well as general readers interested in Roman manners and morals of the period. This title is part of UC Press's Voices Revived program, which commemorates University of California Press’s mission to seek out and cultivate the brightest minds and give them voice, reach, and impact. Drawing on a backlist dating to 1893, Voices Revived makes high-quality, peer-reviewed scholarship accessible once again using print-on-demand technology. This title was originally published in 1964. At the time this book was originally published, John C. Thibault was Assistant Professor of Classics at the University of California, Santa Barbara.